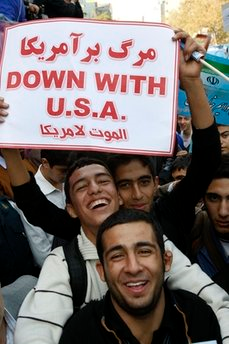 Today in Iran they are ‘celebrating’ the 31st anniversary of the capture of the American embassy by Islamist students. As usual mass protests are scheduled by the government and the authorities get to harangue the USA before hand picked crowds of thousands of students bussed to the capital for the event. After 31 years the USA continues to be identified as the ‘Great Satan’ by the Iranian authorities but why? Most of us in the America laugh at the event and wonder why we are considered the ‘bad guys’ since they were the ones who attacked our embassy and took our personnel hostage. We were the violated party yet we are still called the ‘Great Satan’? Actually the term comes from Shiite Muslim eschatology. According to their ‘end-time’ scenario in the last days before the coming of the Muslim ‘Messiah’-the Mahdi’ also called the ‘Hidden Imam’ or the ‘12th Imam’ in their current cultic understanding. An infidel power will be dominating the world politically, economically, and militarily. That end-time power is called the ‘Great Satan’. The current leaders believe that they are in the end-times and that the 12th Imam is coming back soon. In fact the Ayatollah Khamenei (Iran’s supreme leader) claims that the ‘Hidden Imam’ has appeared to him and told him so!. The current Iranian leaders including President Ahmadinejad and the Ayatollahs identify the USA as the ‘Great Satan’ that must be defeated by the coming Mahdi who according to their eschatological scenario becomes the one world leader and Islam the only authorized religion. But first the ‘Great Satan’ must be utterly defeated and all Jews and Christians that will not join Islam must be killed.